The products are checked at every level to ensure complete flawlessness and customer satisfaction. The Company is guided by one vision - "HEALTH FOR ALL"
A professionally managed organization, Sri Pharmacare manufactures and exports pharmaceutical formulations for better and long lasting life. We are a leading and well recognized name in the field of manufacturing and exporting of a wide range of pharmaceutical formulations for human and veterinary use. With involved operations backed by well developed production facilities as well as service support of experienced team of professionals. Presently, we are offering solutions in form of tablets, capsules, soft gelatin capsules, injections, soaps, cosmetics, veterinary products and diagnostic test kits. One of the most prominent entities in its area of operation, Sri Pharma is involved in manufacture & export of quality and effective Pharmaceutical Drug Formulations. Sri Pharma is a quality driven and progressive organization completely dedicated to customer satisfaction. We seek to maintain a consistency in quality of products by adhering to stringent quality norms where attention is given to every minute detail in the course of production. The competition being very narrow in our field of operation, competitive advantage of a company lies in better services that it offers to outsmart others. In this regard, we are striving for continual improvement. Our ability to deliver products in a timely and reliable manner has earned us a huge client base. The quality of our products is something that we never leave to chance. The products are checked at every level to ensure complete flawlessness and customer satisfaction. The quality inspections are conducted in the laboratories according to the rules evolved by us. A product is sectionalized into several halves and different sets of chemists remain responsible for each one of them, depending on their area of specialization. We have state of the art infrastructure. Our team comprises of highly qualified pharmacists, efficient technicians and skilled workers. 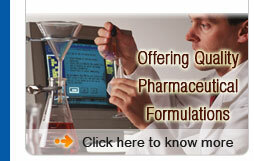 We have engaged experts who have an expertise knowledge and good experience in the field of pharmaceuticals. A laboratory that is equipped with sophisticated analytical equipment that are the best in the industry.